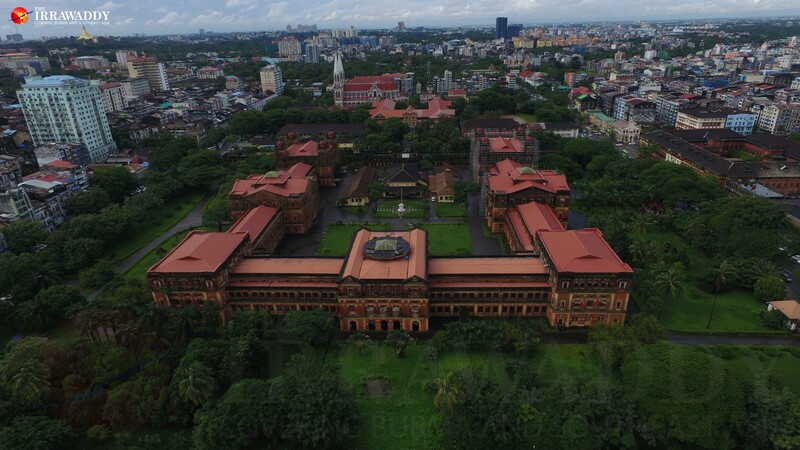 RANGOON — The Rangoon Division government has formed a board of trustees to manage renovations on one of Burma’s most famous colonial-era buildings, the Secretariat, said Rangoon Division Minister for Electricity, Transport and Communication Daw Nilar Kyaw. The head of the trust told The Irrawaddy that the seven-member board, peopled primarily with architects and engineers, will manage the 126-year-old complex’s conservation process—being carried out by the Anawmar Group—as well as certain aspects of the group’s operational procedures, including the selection of Anawmar’s partners. 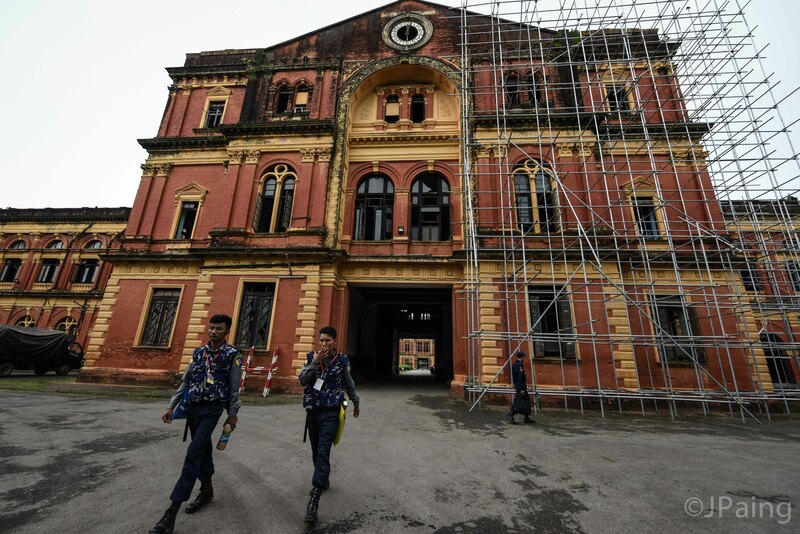 Anawmar, which is owned by family members of former junta general Tun Kyi, won rights from Burma’s Investment Commission in 2012 to restore the building’s architecture and preserve it in the long term as a historical museum and arts and cultural center. Daw Nilar Kyaw said that, given the Secretariat’s towering historical significance, handing over renovations to a private organization had to be handled differently. She added that the trust intends to use Somerset House in London as a model to develop the red brick complex—which sprawls across 16 acres of land in downtown Rangoon—into an arts center. “That’s why we’ve created the trust to assist Anawmar—the main operator—with the conservation and operational processes. We’ll work hand in hand with the Yangon Heritage Trust and Anawmar to make sure everything is right,” she said. Built in 1890, few colonial structures in present-day Burma are as historically important as the magisterial Victorian-era complex located at No. 300 Thein Phyu Road. It served as the headquarters for the British-Burma administration during colonial times. In 1947, Burma’s independence hero Aung San, father of State Counselor Daw Aung San Suu Kyi, and his colleagues were assassinated in an upstairs room in the west wing of the complex. Standing in the center of the Secretariat courtyard is a flagstaff where the flag of a newly independent Burma was first raised on Jan. 4, 1948. After the 1962 military coup, the complex became the Minister’s Office. It was used in this capacity until 2005, when it was abandoned as the military regime suddenly made Naypyidaw its administrative capital. Anawmar eventually stepped in to save the Secretariat from years of neglect. U Soe Thiwn Tun, managing director of the group, said that he welcomed the formation of a board of trustees because it is an authoritative body with decision-making power. “The Secretariat is a part of [Burma’s] national heritage. And so we have to take a great care when it comes to renovation. The trust will be very helpful [in this regard], as [its members] will be able to make decisions regarding dos and don’ts,” U Soe Thiwn Tun said. Still, Anawmar was criticized this past year for its privatization of the colonial structure. Because its significance is so tightly stitched into Burma’s national memory, critics argued, the Secretariat should belong to the public. In response to the public tussle, U Soe Thiwn Tun assured skeptics that the group’s intention is to open the complex to the public, not to develop a hotel or a shopping mall. He also explained that even though Anawmar secured tender four years ago, the group had until recently done little in the way of renovations because it was awaiting approval from the Rangoon Division government, only receiving the go-ahead in 2015. “During that time we could only clear the site,” U Soe Thiwn Tun said. But with the completion of the Conservation Management Plan, which was commissioned by the Yangon Heritage Trust, last September, evidence of renovations is impossible to miss—scaffolding surrounds most parts of the complex. “Facade cleaning is now in progress. However, we’ve been told to suspend additional work until we get further instructions from the trust,” U Soe Thiwn Tun said. He also outlined his blueprint for the refurbished Secretariat: the upstairs rooms in the south and west wings, as well as the old parliament building, will be transformed into public cultural and historical museums and an art gallery; the east wing will be rented out as office space; and small buildings in the complex’s north will be turned into restaurants. “One-third of the complex will be used for commercial purposes since it won’t be easy to cover the cost of renovating and maintaining the building. For office spaces and restaurants, I’ve invited an international partner,” he said. He declined to reveal the name of the partner, saying he was awaiting approval from the Rangoon Division government. He insisted that such partnerships were within the terms of the contract. One of the trust members, Daw Moe Moe Lwin of the Yangon Heritage Trust, which has been providing renovation training to Anawmar, said the formation of the trust made sense. “The government’s involvement in a state-level project like this will have advantages for management as well as for ensuring progress with implementation,” she said. Anawmar’s contract stipulates a 50-year lease to the group for renovations, along with the possibility of two, 10-year extensions. The total investment is US$50 million.